For those of you who did not already know, my husband and I are both teachers. He teaches high school anatomy and forensics (every time I say that, someone says "wow! He must be smart." and yes, he is. ), and I teach middle school and high school art, though I have been on maternity leave for the past 5 weeks. Spring break rolls around and gives us a taste of the freedom that is summer, and from then on, if you do not have a countdown yourself, then one of your teacher friends on Facebook surely does, of the number of days until summer break. The last week of school is torturous. So much to do, so many students needing you to check their grade, or grade their late work, etc. I know so many teachers who get sick the first week of summer because they have just been going nonstop for so long, the first time there is a lull, their body craters. But on top of the huge amount of work, grading, paperwork, etc, there is a buzz of excitement. Planning every weekend from now until August... A need to make the most of every second. A need to make it the best summer ever, for yourself, your spouse and your children - and this is where Pinterest comes in, hahaha. I started with a basic sugar cookie recipe that I found on the Internet. I am not going to share the recipe because I wasn't totally thrilled with it - far too much butter and just not the best recipe out there. I'd love to have a good recipe if someone cares to share! Once the dough was made, I divided it into quarters and put each batch into separate containers. 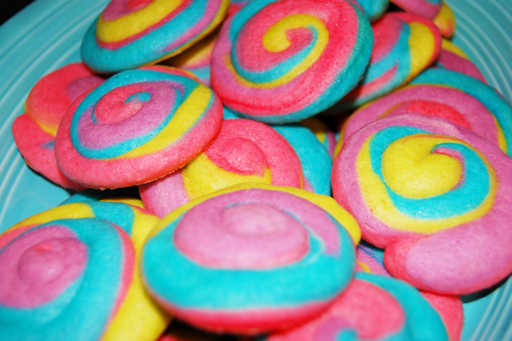 Then I used neon food coloring (about 10 drops) and colored each batch. After thoroughly mixing, I let the dough chill overnight. Chill again... See what I mean?? 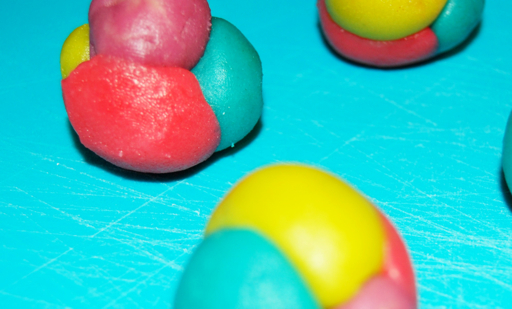 Here's where you need to dig up the old play dough skills that you spent your childhood developing. 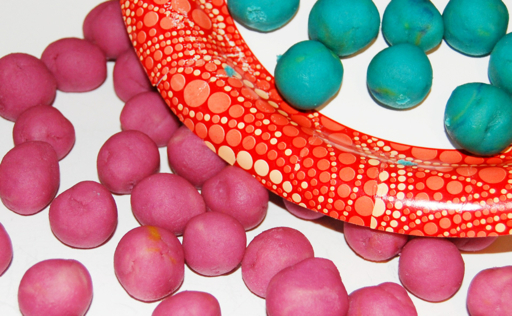 Take each gobstopper ball and roll out into a snake like shape approximately 6 inches in length. 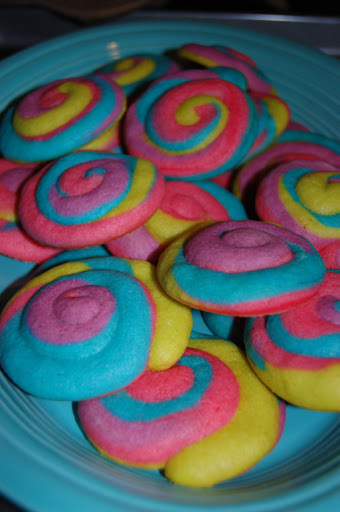 Then spiral your snake into a cookie shape and place on a lightly greased cookie sheet. Bake for 10 minutes at 350 degrees - remove when they are just starting to firm up. I recommend working in small batches so that you have some in the fridge to reduce the inconvenient chill time. These are really impressive looking cookies, and I am definitely glad I made them, but I will wait for a more appreciative crowd than an 18 month old before attempting them again, haha. I needed some oohs and ahhs for all that hard work!! Wonder if this would be fun to get a little guy baking with me?! Might have to try! Good job! !